My family and I (understand my dear husband and daughter, and my 2 feisty Jack Russell Terriers Toyen and Yoda) visited beautiful Emerald Isle this Summer. Our family really needed it. I brought knitting with me - a halter top I started for my daughter in the winter that I never finished; plus a second project (a garter stitch baby overalls - simpler than the BABY JUMPER in my LATEST VIDEO I videotaped for both, righties and lefties) - just in case I wouldn't have anything else to do when everyone is relaxing after a walk around nearby towns on a hot day, or after time spent at the peaceful, but windy beach. When I was researching the area on "Google Maps", I noticed that there is a "Salty Sheep Yarn Shop" in Swansboro. On one of our local trips I my family and I drove to this town. My husband and daughter enjoyed sitting on a comfy couch while I browsed this yarn store on West Church Street. I totally enjoyed being surrounded by so many skeins of fabulous yarns, and of course, I had to spend few dollars there. Would you expect me to do otherwise? After all I supported our economy. But I will write about that later. 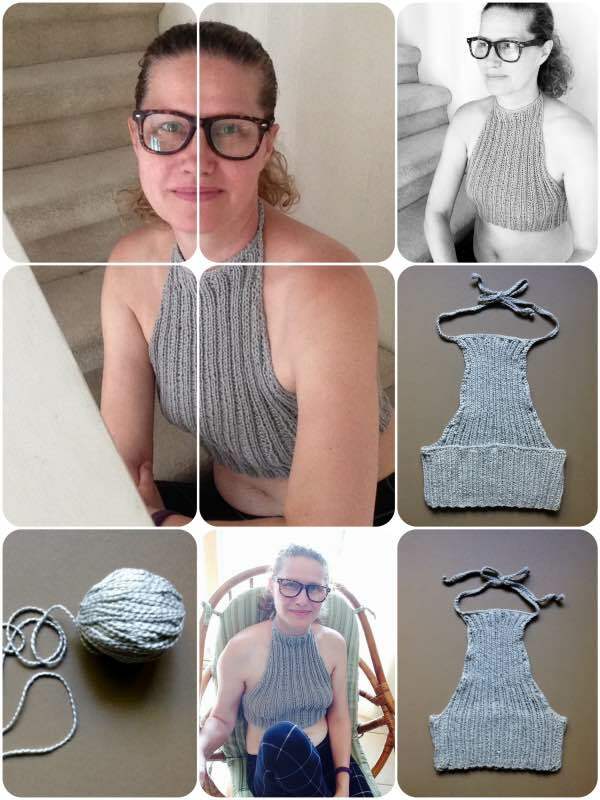 After I came "home" from the store, I decided to finish the halter top. However, I miscalculated the size of the top, so when I was finished, it fit me instead of my daughter. Now she has to wait for her tank top that I will knit from the yarn she picked at the "Salty Sheep Yarn Shop". And me? I have to do many sit ups, because my belly just doesn't look good while wearing this top. (FYI - I sucked my belly in as much as possible, so it looks good in the pictures 😂 ). 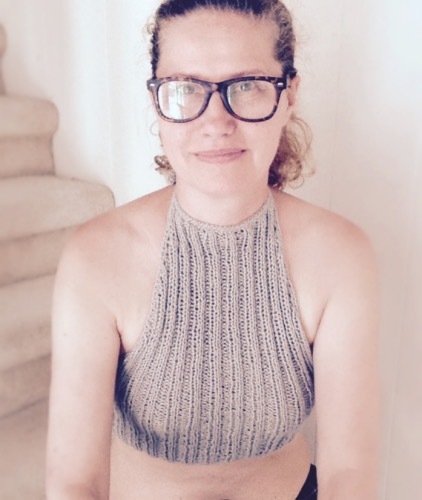 Below is free pattern for the "Summer Rain" halter top. Enjoy. Happy knitting. Medium - about 30" around the rib cage (below the chest), 15" top to bottom in the front, 5" top to bottom in the back. Row 31 BO all stitches. Leave a long tail for either sewing (or crocheting) both pieces together. Row 1-30 same as "BACK PART"
Note: For short halter top back I knitted 30 rows, if you want your halter top longer add more rows - your front rows must correspond with your back rows. Work Rows 37 through 42 - until you have 36 sts on your needle (you should end up with total 84 rows). Then BO all sts. 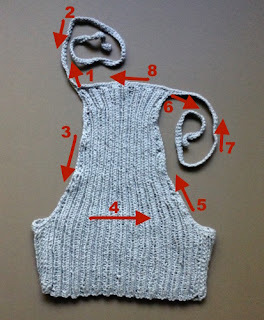 Do not cut your yarn off - you will use your uncut yarn to finish your top. 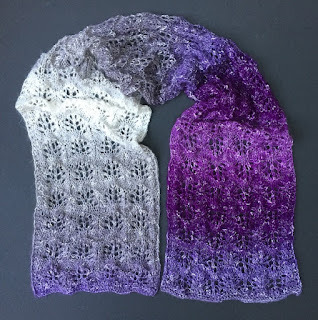 Crochet or sew sides of both pieces together. Starting at your corner, where is your last BO stitch (1), crochet about 70 chain sts as your foundation. Then skip one chain stitch and make 1 sc into each chain stitch - this will be your first strap (2). 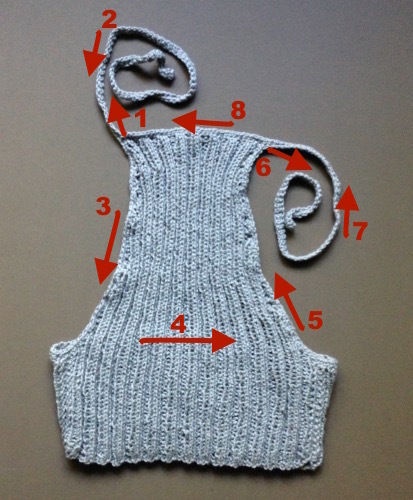 When you get back to your corner where you started, continue making sc sts all along the edge of the halter top - distribute stitches evenly (3), (4), (5). When you get to the next corner of your front piece, crochet again 70 chain sts (6), and again crochet 1 sc st into each chain st on the way back to the corner (7). Then continue crocheting 1 sc st into each st along the top edge of your front part (8) finishing at the start (1). Fasten off and weave in all the tails.